Want to check out Tsugumi Ohba and Takeshi Obata’s popular manga before, say, Netflix releases its adaptation next year? Well, this new Japanese release of the entire thing in a single book could be up your street, as well as double as a solid enough weapon against potential home invaders. This ridiculous tome weighs 10 pounds and was released in Japan by Shueisha recently for the relatively low price of 2,500 yen, or around $25. Not bad for a reading experience that could also double as an effective bludgeon. 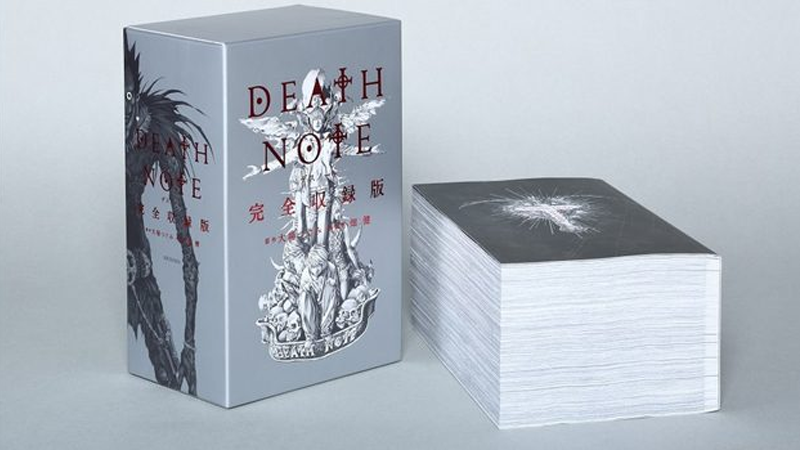 It features the complete story of Light Yagami and the titular death note, the mysterious notebook that, once a name is written in it, can murder someone—all 12 volumes of it—in a single book. Honestly, the real draw here isn’t getting to read Ohba and Obata’s work in its entirety, but the fact it’s in one hilariously giant-sized volume. It’s sold out in Japan, but you could get a more sensibly-divided 12 volume collection in the US for $70. But where’s the fun in a manga reading experience that can’t also be used as an offensive weapon?